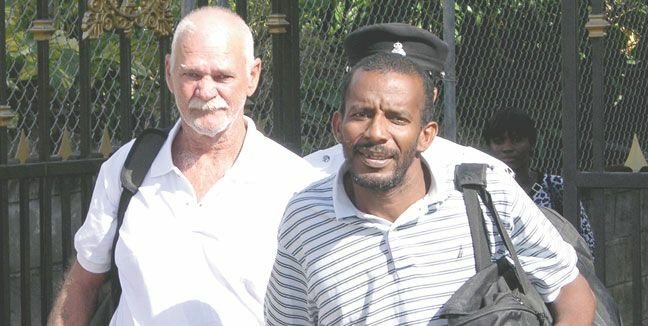 The case, which heard prosecution witnesses giving evidence from August 9 to 12 at the Serious Offences Court, involves Antonio âQue Pasaâ Gellizeau, Bermudian Winston Robinson and Trinidadian, Kent Andrews. Gellizeau is charged with concealing on the Yacht âJotobinâ on April 5, 2008, at Calliaqua, property of US$1,733,463 (EC$4,628,346), which in whole or in part, directly or indirectly, represents proceeds of criminal conduct. He is also charged with bringing the money into St. Vincent and the Grenadines on the yacht. Both Andrews and Robinson were charged with concealing US$1,733,463 (EC$4,628,346) on the yacht Jotobin on April 5, 2008 at Calliaqua, knowing or suspecting or having reasonable grounds to suspect, in whole or in part, directly or indirectly that the money represented another personâs proceeds of criminal conduct. They are also charged with bringing the money into St. Vincent and the Grenadines. Winston Robinson was charged with entering SVG with out notifying the Comptroller of Customs of the intended time of arrival. Thirteen prosecution witnesses have already been called in the matter, with another 20 to be called when the case resumes on September 12, 2011, at the Serious Offences Court. It is expected that witnesses from Bermuda, St Lucia and expert witness from the United States will be called to testify. Giving testimony was Corporal 93 Duane Bailey, who testified that on Friday, April 4, 2008, at about 6pm, that he was among a party of Rapid Response Unit (RRU), Narcotics, Financial Intelligence Unit and Coastguard personnel at the Coastguard base at Calliaqua. Bailey said they boarded a Coastguard vessel and headed to Admiralty Bay in Bequia. While there, he said, at about 1:05 am, instructions were given to board Jotobin, which was anchored at the Bay. He added that the Coastguard vessel pulled up alongside the yacht, where he and two other police officers went on board Jotobin. The occupants, Robinson and Andrews, were met asleep and were awakened by the lawmen. Bailey said they were questioned about their names and country of origin. He said Winston told him that he was a 65-year-old, retiree of Bermuda, and Andrews said he was 38, of Trinidad. Robinson said he was the captain of the yacht. A total of four cellular phones were confiscated from the men, two from each of them. Later that morning, at about 6:00 a.m., the men were escorted on their vessel back to the Coastguard base. The men were asked where they were coming from and Robinson said they were touring the islands, and they had just left Union Island and ended up in Bequia. Andrews gave the same reply. In the testimony of Corporal 168 Fitzburne Chambers, he told the court he was a part of the party that went to Bequia. He said after both vessels arrived at Calliaqua, another search was conducted, but nothing was found on board Orion and Gellizeau was released. However, while searching Jotobin, Chambers said in the left cabin, just below the bow of the boat, he saw some items, which included bed materials, among others. He said he then saw a metallic tank covered with foam. Chambers said he became suspicious and attempted to remove the foam with a knife. While cutting away the foam, Chambers said he saw a piece of transparent plastic bag containing United States currency. He said 44 packages containing the monies were retrieved from the right cabinet and another 44 from the cabinet on the left side of the bow. In the testimony of Italian businessman and managing director of JT Yachting SVG ltd, Antonio Genchi, he told the court that he had bought the Jotobin in 2006. He said it was an old boat, and at the time, it was giving problems, so he put it up for sale. He said he placed the boat at Young Island and had an asking price of US$100,000. He noted that Gellizeau bought the vessel, but the price was reduced to US$85,000 because of problems encountered with the boat. He said in October 2008, sometime after the boat was purchased, police carried Genchi back to the boat, where he said he saw the boat with a different engine and new items added. Genchi said he was shown two cabins in the right and left of the bow of the boat and said he noticed a tank with a lot of foam around it. He told the court when he sold the boat the tank only had epoxy solution around it. If convicted, the maximum penalty that can be handed down is five years imprisonment and or a fine of $500,000. Alberton Richelieu, Theodore Guerra S.C. and Stephen Williams are the defence attornies in the case.